Business Intelligence (BI) platforms are making great headway across a broad range of industries. Enterprises are increasingly harnessing the power of BI to achieve their set business goals. The implementation of a competent BI system presents businesses with actionable insights which translate into an ability to assist key personnel to make better and faster decisions. This revolutionary decision to adopt BI has made businesses more data-driven in order to decrease costs and witness an escalation in profits. In today’s age, BI does not require investment in huge hardware infrastructures. One can implement BI on existing hardware or by running it on virtualized hardware in the cloud. But to accomplish this, businesses need to employ the right vendors with the solutions that cater to their unique requirements and possess the technical prowess as BI demands extensive training. Recognizing the potential this sector has, there has been an influx of vendors providing such solutions in the market, making the selection of the right vendor to work with a cumbersome job. Businesses need to find a vendor they can work with rather than employ and guide them to attain their business goals. 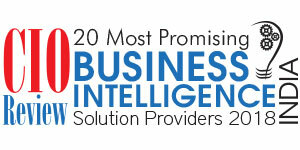 CIOReview comes to your aid with a list of “20 Most Promising Business Intelligence Solution Providers”. The aforementioned list proffers an inventory of skilled vendors with industry rich experience and a proven track record against their name. An eminent advisory board consisting of CEOs, CIOs, industry analysts and CIOReview editorial team has scrupulously researched and settled in on a select few who we firmly believe can assist businesses to make an intelligent business decision with increased operational efficiencies and simultaneously offering better customer satisfaction. We present to you CIOReviewindia 20 Most Promising Business Intelligence Solution Providers - 2018. Blueocean Market A provider of a portfolio of services in the area of Big Data Engineering, BI and Visualization, Advanced Data Sciences, Digital Engineering and Unstructured Data Analytics etc. EasyReports A provider of Business Intelligence, Reporting and Analytics, Consulting, and Tally Integrated Solutions to small and medium sized enterprises. Liases Foras A provider of Business Intelligence and Risk Analytics for supporting Banks, HFCs and Corporates. Team Computers A provider of Business Analytics solutions for industry verticals like Automotive, Insurance, Banking, Manufacturing and Government etc. Systweak Software A provider of implementation & support services for ERP (Compiere, Adempiere, Open ERP), Business Intelligence (Pentaho), and Force.com Platform etc.